To address the complex challenges created by today’s digital marketing landscape, marketers are looking to AI technologies to analyze and understand huge amounts of data so they can develop strategies to optimize customer engagement. They need deeper data analysis, the ability to understand campaign performance, faster decision-making, and personalized and optimized campaigns coordinated and executed across multiple channels. According to a recent commissioned study conducted by Forrester Consulting on behalf of Albert, the number of marketers leveraging AI technologies has increased from a mere 43% in 2016 to an overwhelming 88% in 2019. 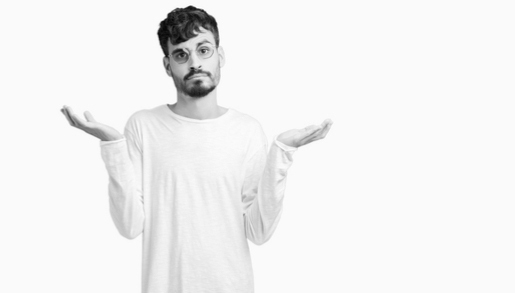 Yet, in the same survey, only 50% of marketers said that their current marketing technology was able to provide marketers the ability “to gain more direct control over digital media buying”. The percent of marketers who reported that their current marketing stack was able to deliver on other key marketing objectives was as little as 33%. Why the paradox between the high adoption rate for AI and the underwhelming impact marketers have seen? Is there a misalignment between the expectations for AI and its ability to deliver on marketers’ needs? In short, the answer is no. The limited impact of AI technologies today is the result of how it is being implemented by technology providers and used by marketers. In fact, research shows that the way in which companies adopt and implement AI technologies has a huge impact on its ability to deliver on key marketing KPIs, such as improved campaign performance and ROI. Specifically, the research compares the impact of AI-assisted marketing to that of AI-autonomous marketing. With AI-assisted marketing, marketers leverage AI technology from an operational perspective – for example to perform a specific task or make decisions within a defined channel. With this approach, AI can accelerate data analysis and provide insights on campaign performance in near real-time, but the ability to execute on the analysis and insights will continue to be limited by marketers’ time and bandwidth and the true power of AI will not be realized. 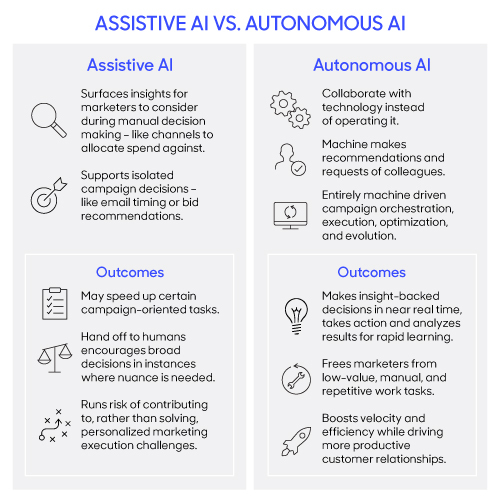 Marketers using an AI-autonomous approach adopt AI more holistically. Autonomous AI marketing employs the technology to move beyond the operational tasks of data analysis to decision-making and execution within as well as across channels. By leveraging AI to drive the process from data collection and analysis through to strategy and execution, it allows the technology to measure engagement data, make recommendations, and execute in near real-time. It also enables the ability for true customization and personalization as AI has the capability to analyze and manage vast amounts of data and to act on a scale that even a small army of marketers couldn’t match. With this approach, AI-autonomous marketers are better able to harness the full potential of AI technologies. To find out more about the challenges marketers face in adopting AI technologies and how marketers are successfully implementing AI, please join our upcoming webinar.